OCMC Executive Director, Fr. Martin Ritsi (center) and Project Mexico Executive Director Dn. JP Andrews (center left) with others who participated in 2018 Swim for Hope that benefited ministries of Project Mexico and the Orthodox Christian Mission Center (OCMC). On Friday, September 7, Project Mexico and OCMC came together in the Swim for Hope fundraiser to support the mission work of both organizations. Among the participants were Father Simeon Corona and Deacon Demetrios Andrews (Executive Director of Project Mexico) who swam, as well as Father Martin Ritsi (Executive Director of OCMC) who kayaked. Together, they crossed 16 miles! 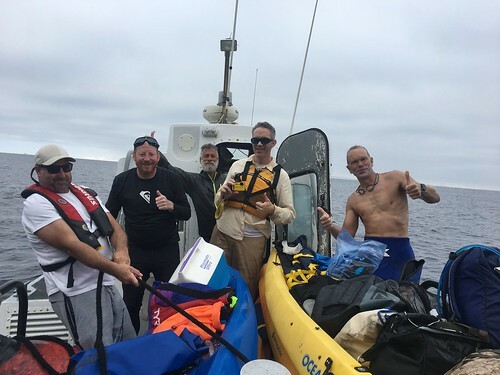 They journeyed over the course of about 9 hours, setting out at 8:30 AM PST from San Diego and finally reaching the Islas Coronado off of Mexico's coast at around 5:30 PM. As they did so, many followed their progress via a live GPS feed that Fr. Martin broadcasted durning their journey. By means of this rigorous fundraiser, they showed their great dedication to the cause of supporting Christ’s great commission. The connection between Project Mexico and OCMC is a natural one, because it is the mission of both to share the love of Christ by any means available. For that, it was a great blessing for the two organizations to come together in this effort. And the effort was indeed a success, because it raised a total of $10,147.10 in donations! This marked a 17% increase from the donations of last year’s event and will provide significant support for both organizations. This was an incredible collaboration between two beautiful ministries of the Church. Thank you for your ongoing prayers and support, and especially for your contributions to the Swim for Hope fundraiser!